HONG KONG - Japanese shares led declines in global Asian stock indexes on Monday after preliminary quarterly economic data showed the country returned to recession. Shanghai stocks rose briefly as international investors piled into the Chinese market on the debut of a landmark cross-border trading link giving greater access to outsiders, but ended lower after the daily quota was reached. European shares sank in early trading, with France's CAC 40 down 0.7 percent to 4,174.12 and Germany's DAX falling 0.8 percent to 9,182.65. Britain's FTSE 100 lost 0.4 percent to 6,627.03. U.S. shares were also poised to open lower, with Dow futures down 0.2 percent at 17,578.00 and S&P 500 futures dipping 0.3 percent to 2,034.90. Preliminary data showed that Japan's economy, the second biggest in Asia, turned in a worse-than-expected performance in the July-September period by shrinking 1.6 percent. The result, which followed a 7.1 percent contraction in the previous quarter, muddies the outlook for the global recovery and raises the likelihood the government will delay a planned raise of the sales tax next year. Shanghai shares were propelled higher for most of the day by the launch of a cross-border trading link with Hong Kong, but after the daily limit for Hong Kong investors was exhausted they joined the global trend and sank into the red. The Shanghai-Hong Kong Stock Connect opens the way for greater investor access to each other's exchanges but interest was clearly greater in shares listed on the mainland, where access to outsiders has been tightly restricted. Until now only a small group of designated fund managers have been granted a quota to buy China shares. Japan's benchmark Nikkei 225 index slipped 3 percent to close at 16,973.80 while South Korea's Kospi dipped 0.1 percent to 1,943.63. Hong Kong's Hang Seng slid 1.2 percent to 23,797.08. In mainland China the Shanghai Composite Index was higher for most of the day but changed course after the daily quota was reached, ending 0.2 percent lower at 2,474.01. Australia's S&P/ASX 200 fell 0.8 percent to 5,412.50. 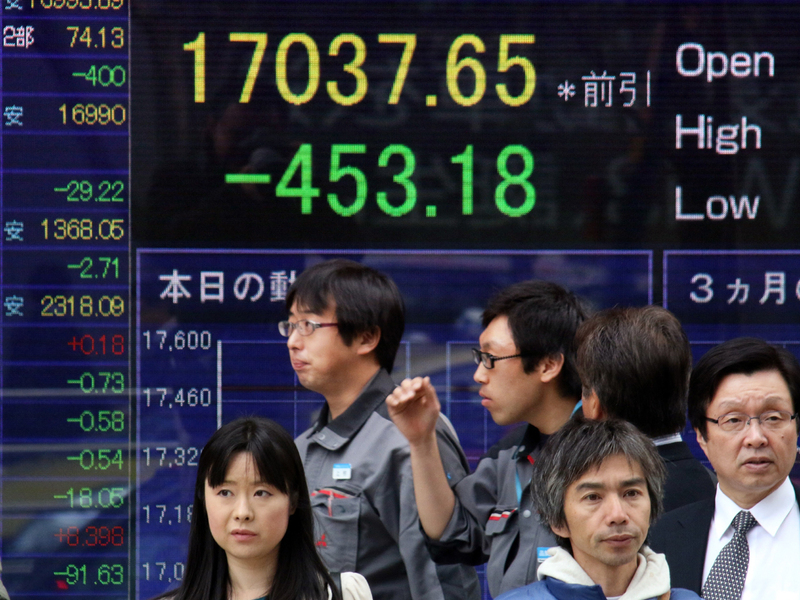 The dollar slipped to 116.09 yen from 116.29 in late trading Friday. The euro fell to $1.2504 from $1.2523. Oil prices slipped, with benchmark crude for U.S. delivery slipping 93 cents to $74.90 a barrel in electronic trading on the New York Mercantile Exchange. The contract rose $1.61 to close at $75.82 on Friday.